For Their Memory is a musical project honoring the memory of the 1,138 people who died in the tragic collapse of the Rana Plaza fashion factory and the other countless lives lost to the vicious and soulless cycle of overproduction and overconsumption. Human exploitation has been inherent in the fashion industry for far too long. Slave Labor. Sweatshop Labor. Debt Slavery. Wage Slavery. Why do we accept the association of these injustices with the clothing we put on our bodies? 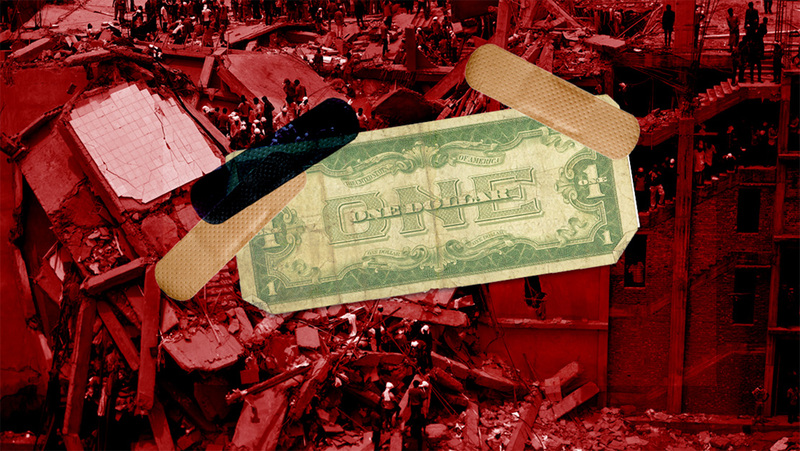 When Rana Plaza collapsed, the people working there, an overwhelming majority of them women, were paid around $38 a month - $67 less than a living wage in Bangladesh where the factory was located*. Around the world, including across the USA and Europe, the people who make our clothing continue to bear the cost of our demand for low prices. Let's make time to think about these people now. Look at the tag(s) on the clothing you are wearing today. Where was it made? Select that country from the list below. Look at the tag in your shirt/dress/pants or other item of clothing. It should say "Made In ___". Pick that country. April 24th, 2013 is a day that Reba Sikder will always remember. Trapped under a sewing machine and a slab of concrete, Reba watched as her friends died beneath the rubble. Days later Reba managed to escape the collapsed fashion factory, but not without injury. The day before the collapse, Reba and her colleagues had raised concerns about building safety when they saw cracks in the concrete of the eight story factory and shopping complex. But the people working at Rana Plaza cutting and sewing clothing for mostly European and American brands were forced to continue their work under the threat of withheld wages and physical violence. In 2015 Reba visited the USA to share her story with the hope of provoking tangible change - change that is still overdue. Reba asked why we, American consumers and brands, were not demanding and making a change. Hearing Reba speak of her experience inspired the creation of For Their Memory - a project by The OR Is Present. The OR Is Present is the cultural studio of The OR Foundation, a small not-for-profit based in Cincinnati, Ohio. The OR Foundation was founded in 2011 by Liz Ricketts and Branson Skinner with the mission of bringing conversations around ethics and fashion into classrooms, after-school programs and community centers across the USA and beyond. For Their Memory is available for download and streaming on all major digital music services. Music can connect and inspire us, but music alone does not change the everyday circumstances of the people who work in unsafe and unsustainable conditions making clothing. All of the money raised through song sales, royalties and contributions will be directed through The OR Foundation, a US-based 501(C)(3) not-for-profit, to address the systemic challenges of the global fashion industry and to improve labor conditions. Yet still there is more work to be done than music and money can achieve. This project is the humble response of a collective of individuals who felt compelled to share their perspective. We invite you to listen to the song while exploring the website and linked content within. Branson grew up in a musical household. Prior to attending NYU, where he studied globalization and co-founded a fair trade fashion cooperative in Ghana, he released two full-length solo albums and two E.P. 's as a singer/songwriter. Today Branson serves as the co-founder and producer of The OR Foundation, a small not-for-profit educating about ethical issues within the fashion industry. In this capacity he has co-facilitated work with learners across the USA, in Ghana and in South Africa. Moved by meeting Reba Sikder, a survivor of Rana Plaza, Branson wrote For Their Memory on ukulele while teaching a class of middle school students about the social and environmental impacts of the fashion industry. 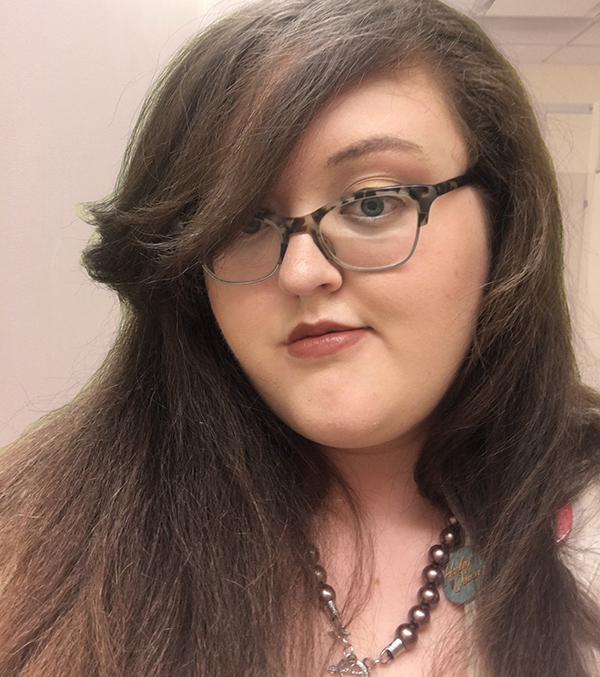 Branson has taken classes with Berklee College of Music Online and is presently a student in the Master of Community Planning program at University of Cincinnati. 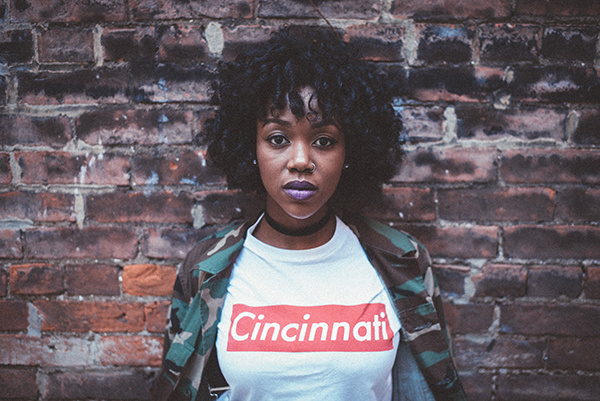 Lauren Eylise is an award-winning singer and songwriter from Cincinnati, Ohio whose impactful lyrics and powerhouse vocals have settled the musician in a lane of her own. She has toured both as front-woman of her band and solo acoustically. As she releases her debut album on September 29th, Lauren Eylise is constantly challenging herself to grow as an artist and to maintain an innovative approach to sound. Lauren is dedicated to bringing storytelling back to songwriting, a desire that For Their Memory surely satisfies. "The song tells an important story and even more importantly, calls each listener to action", Lauren explains. "It's important to me that the music I create touches and moves those who experience it and I believe this song does just that." To learn more about Lauren Eylise, visit www.laureneylise.com and follow @LaurenEylise across all social media outlets. After studying fashion design at the University of Cincinnati, Liz worked as a stylist and designer in New York City. This led her to question how the value of clothing is defined. Today, Liz serves as the co-founder and director of The OR Foundation, a small not-for-profit educating about ethical issues within the fashion industry. She has developed extensive curricula and worked with learners in Ghana, South Africa and across the USA. Liz graduated as an Urban Scholars Fellow from the Harvard Graduate School of Education in 2016. In addition to her work with The OR Foundation, Liz teaches as an adjunct instructor in the College of Design, Architecture, Art and Planning at the University of Cincinnati. Brenda Wedinger is an American artist, designer and student at the University of Cincinnati. Not bound to definitions of genre, she explores a variety of mediums. A juxtaposition of materials, purposes and forms, as well as architectural elements, can be found throughout her work. Brenda is also a believer in creating within closed loops systems - meaning that with each project she utilizes existing resources to create no waste pieces or objects that can be repurposed continually. "I got involved in this project because it was the right thing to do. It seems that we have a limited number of years left on this planet and if we can spend some of that time righting the fashion industry's wrongs, it's time well spent. I didn't lose my best friend, my sister or my mother in Rana Plaza, but someone did and they shouldn't have because it could've been prevented. If I stand still and do nothing, I am just as guilty as the corporations." 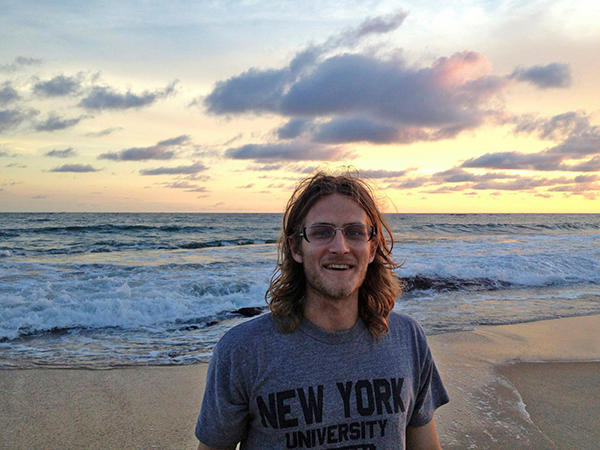 Domenic Ashburn is a visual artist and entrepreneur currently studying at the University of Cincinnati. 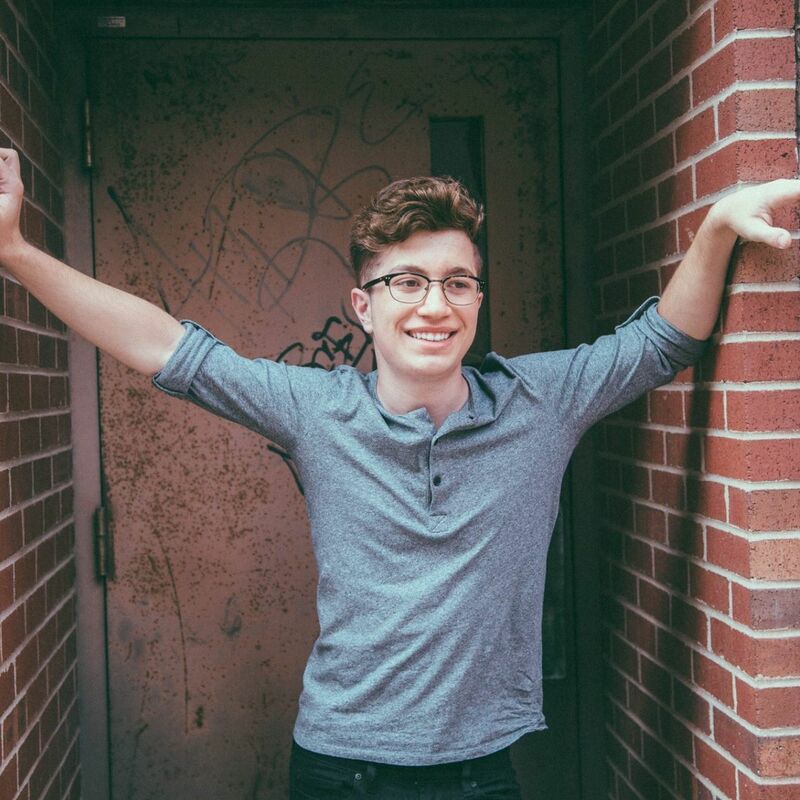 After learning about the Reba's story and the challenges of the fashion industry in a class taught by The OR co-founder Liz Ricketts, Ashburn decided to lend his talents to For Their Memory by creating a music video. Nyjul is a 21 year-old, self-taught dancer and choreographer from Cincinnati, Ohio. He is a member of the UC Dhadak International Dance Team, from which two other members participated in the For Their Memory music video. 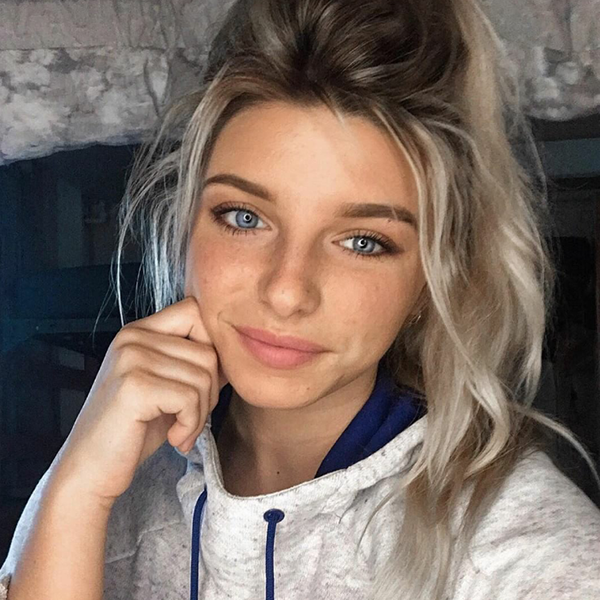 Zoë is a first year student at the University of Toledo. Originally from Dayton, Ohio, now a student in Pre-Law, Zoë hopes to elevate positive messages. Jay Smith is a student in the Digital Media Collaborative at the University of Cincinnati. He is an avid film maker and music producer aiming to create a platform through his art to empower positive messages. Reese is a filmmaker studying at the University of Cincinnati's Digital Media Collaborative. 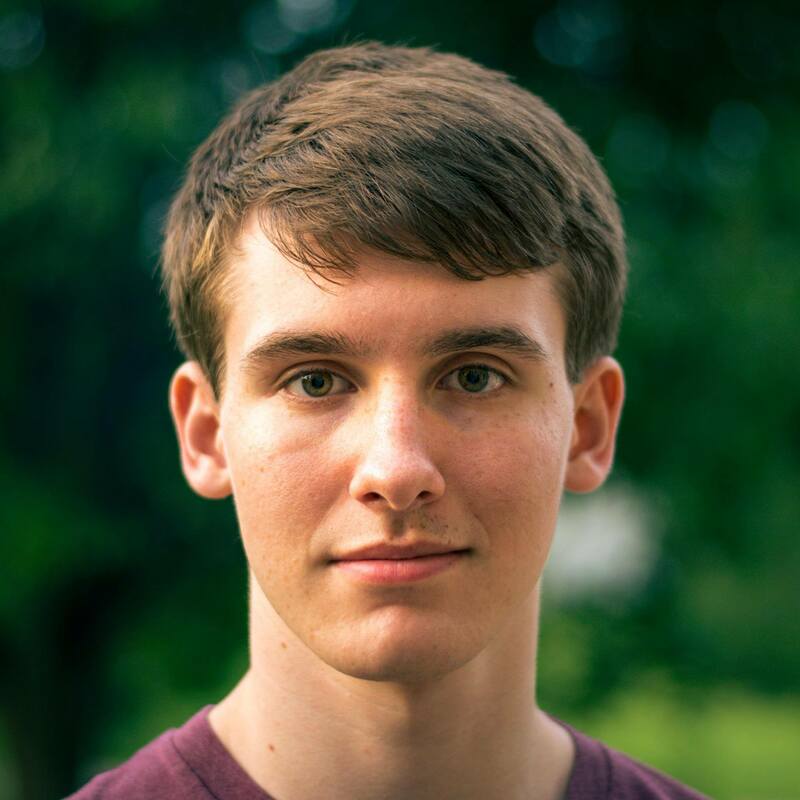 Peter Birsen is a sophomore studying Digital Media at the University of Cincinnati. He is a writer, director, producer, and director of photography. Additionally, he is a co-founder of Broken Drawers Productions. John is a graduate of University of Cincinnati's College-Conservatory of Music. He makes music at johnhoffmanaudio.com and manages Ultrasuede Studio in Cincinnati, Ohio. Piper is the owner and chief engineer at Neato Mastering. 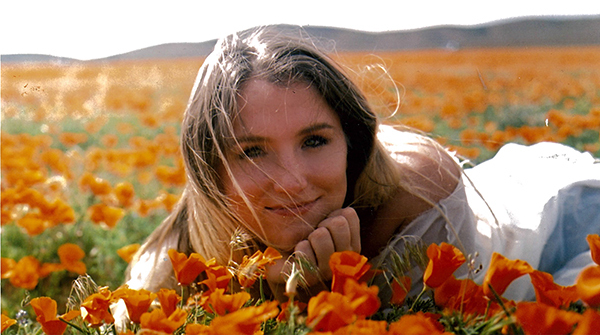 In addition, she is the President of the San Francisco Chapter of the Recording Academy and is also on the committee of the AES SF Chapter and an active member of the Women's Audio Mission. Piper is an audio professor and guest lectures often about mastering and recording. Her focus is mastering and she lives for quality and equality in audio. Look, the politics of charity are complicated and our intention is most certainly not to capitalize on Rana Plaza, a horrific event with long-lasting every day consequences that the creators of this song do not face in their own lives. The reality is this - we made this song and decided to put it out there into the world. Putting it on the Internet through various platforms means that the song could make money if people listen to it. We, The OR Foundation, don’t know how much money it will make, but we do not want to keep that money so we have decided that the majority of any funds we do raise will be redistributed to organizations having a more direct impact on the lives of garment workers like Reba. Bangladesh Center for Worker Solidarity (BCWS) - Founded in 2001, the BCWS campaigns for greater transparency, workplace safety, fair wages and the right to form unions in Bangladesh’s fashion factories. The center trains and organizes garment workers to make their voices heard. The co-founders of The OR Foundation met Kalpona Akter, the Founder and Executive Director of the BCWS, when she came to the USA with Reba Sikder. Kalpona began working in fashion factories at the age of 12 and formed the first union in her factory at age 15 for which she was fired a year later. She has been a civil and labor rights activist since. Find out more about Kalpona and take a minute to learn more about the importance of training programs like fire safety offered by BCWS. Fashion Revolution - An organization fighting for greater transparency in the fashion industry. 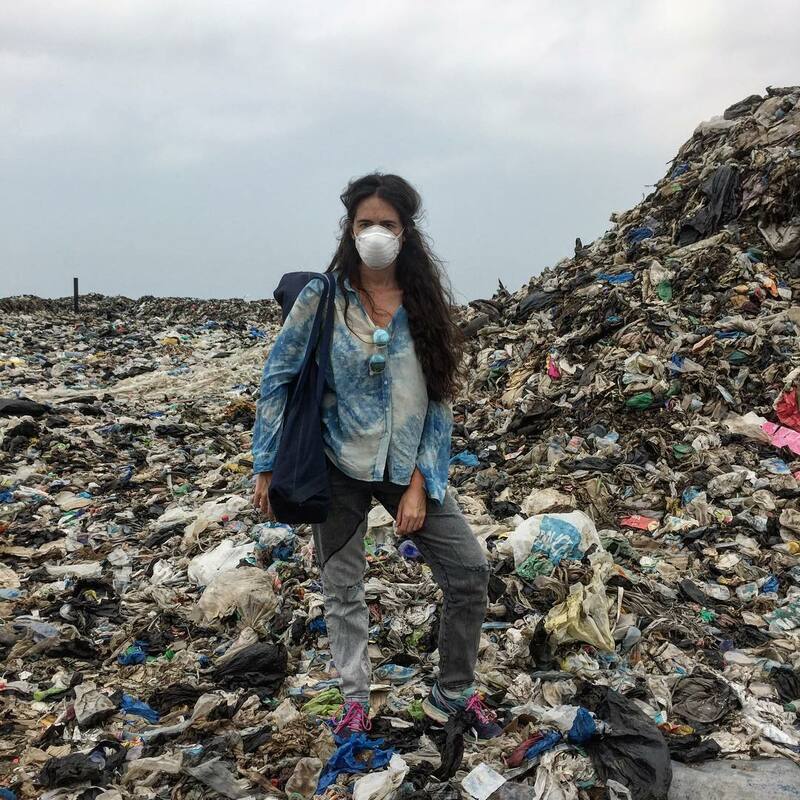 Since its founding following Rana Plaza in 2013, Fashion Revolution has catalyzed millions of people around the globe to demand change through advocacy events, educational resources, research and social media campaigns. While Fashion Revolution began by asking one question in a social media campaign #whomademyclothes, today it is a cornerstone of a global movement and is spearheading projects like the Garment Worker Diaries and the Fashion Revolution Podcast. Even though the people making clothing bear the brunt of the ethical challenges facing the fashion industry, these challenges are deeply rooted in consumer behavior. We believe that Fashion Revolution builds a bridge between the production challenges and the consumer response that is vital to true systemic change. Clean Clothes Campaign - Since 1989 Clean Clothes Campaign has brought together labor unions and NGO’s across a broad spectrum in both garment-producing countries and consumer markets to address issues such as women’s rights, poverty reduction, and consumer advocacy, with the ultimate goal of improving working conditions within the fashion industry. Clean Clothes Campaign is a partner organization and key facilitator of the groundbreaking Living Wage Report released in May of 2017. Clean Clothes Campaign has also been instrumental in the collection of funds for Rana Plaza victim compensation. The remainder of funds raised will support The OR Foundation’s curriculum development and research. Has Reba Sikder Heard The Song? Yes. She is happy to know that her story has had a lasting impact. That is NOT the question to be asking. Obviously, if and when you make clothing purchases you should support companies you respect, companies that stand for the kinds of things you care about. But shopping better will not, by itself, bring about a revolution. Voting with your dollar will not shift the paradigm of overproduction and overconsumption. Buying into the idea that ‘ethical’ shopping decisions are the sole solution will stop us from asking new and more transformative questions when confronted with tragedies like Rana Plaza. Right, So What Can I Do? For licensing, press and all other inquiries please contact lizandbranson@theor.org. 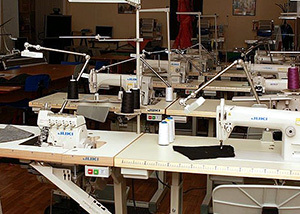 With its headquarters in Japan, JUKI Corporation is the leading global supplier of industrial sewing machines. Since 1982 JUKI has been doing business in Bangladesh where the machines are ubiquitous in fashion factories. There is no proof that consuming cheap clothing makes you happier or richer. In fact there is the opposite. We tell ourselves that we need things that we do not need. We tell ourselves that the price is right because it is what everyone else pays. We know that sweatshops and poor labor conditions are a reality, but we tell ourselves that it will never touch us. We tell ourselves that we are powerless. Why Don't We Make A Change? When Reba visited the USA to share her story she asked this exact question: "Why don't you - the consumers, brands and American government - make a change?" Reba and her colleagues at Rana Plaza were sewing Western style ‘ready made’ shirts and pants, but in most cases they did not buy and wear these same styles themselves. 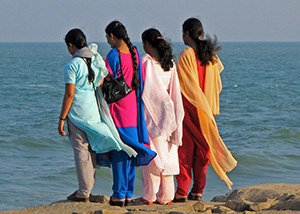 There are many cultural reasons for this, but the fact that Bangladesh, the second largest garment exporting country, is generally not exporting the fashions many people choose to wear domestically is important. It points to a global imbalance where export policies are driven by a competitive advantage of the low cost of labor. More human beings have been killed and injured making clothing than we will ever know. From the plantation fields of the American South to the factories of Bangladesh, millions of people have suffered. But imagine if we knew their names. Imagine if we knew the people making our clothes. How would we change?